Whether they live under a pizza box or within a stack of firewood, nearly all roaches polled said environmental conditions on Earth were actually improving even faster than they could have hoped for. NEW YORK—Declaring that their outlook is as hopeful as it’s been in decades, an overwhelming majority of the world’s cockroaches said in a poll released Thursday by the Pew Research Center that they felt “highly optimistic” about the future of the planet. The poll, which surveyed 500 million of the nocturnal scavenging insects, found that more than 95 percent believe the environment is headed in the right direction, and that in the coming years the conditions in their sewer, rotted-wood, and residential habitats stand to improve dramatically. “It just puts my mind at ease to know my hundreds of kids are going to inherit a planet where they can thrive and where they can one day deposit their own egg cases without worrying,” she added. Across species, cockroaches offered robust support for prevailing trends in environmental policy, with 86 percent expressing enthusiasm for technologies such as fracking and open-pit mining, 81 percent praising the growing demand for disposable consumer goods, and 84 percent saying they were happy with the amount of industrial runoff in ground soil. Another 4 percent reportedly skittered away beneath a baseboard crevice before answering any questions. 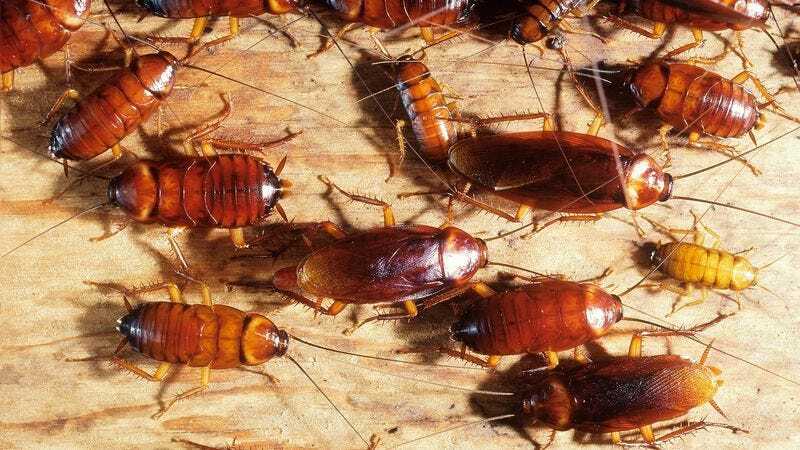 The survey also noted an unusually dramatic shift in cockroach attitudes in just the past year, with optimism about the planet’s future plummeting after the Paris climate agreement was signed last April, but then suddenly rebounding to an all-time high by the second week in November.